But as I started reading Earthsea, I was struck by the beauty of the writing. And it wasn’t just about the words, but in what was floating between the lines. A certain wisdom, certain ideas that turn over and over in your mind as you read. That’s what I read for. And that’s what I found in Earthsea. The first three books are coming-of-age novels of 3 different people: the troubled wizard Ged, the lonely priestess Arha, the promising prince Arren. And in each book you come across the main characters from different perspectives, which feels quite exciting, as you know more about these ‘people’ than the characters they are interacting with. And yet. There are moments of real doubt, of pain, of boredom. Le Guin has imbued reality into the fantasy world she has created. There, thought Arren, lay the very heart of wizardry: to hint at mighty meanings while saying nothing at all, and to make doing nothing at all seem the very crown of wisdom. Le Guin’s books touch on philosophical questions, and truths, but these are embedded in the narrative. Characters are constantly plagued by their inefficacies and weaknesses, but never in a romantic, indulgent way. Life is hard for these characters, and it is always hard, even when evil is vanquished. There are no happily ever afters, not really. The wizard Ged, having destroyed evil, is not triumphant, but spent. A lot has been written about the patriarchal world of Earthsea. It didn’t bother me as much as it has others, though it is very noticeable. But don’t we live in a patriarchal world? Is it not fair to represent reality as it is, through the lens of fantasy? When you’re expecting fantasy, it is more likely that you’ll be confronted by everything that’s wrong with reality. Isn’t it more interesting to depict reality in that fantasy world, including a patriarchal society where the men go out and do things? Le Guin clearly had thought about this, and in the second and fourth books, the protagonist is a woman. 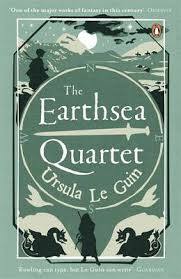 What is interesting about the second and third Earthsea novels is that the protagonist is a woman who is engaging with a world where it is the men who go out and do things. In the fourth book, however, this engagement feels obtrusive. Where the book dragged: The fourth book is very different from the first three, and was hard to get through. Tenar’s voice reads like a feminising sermon at times. It’s also out of place with the rest of the book, which is subdued, subtle, challenging the mind to be attuned to nuances. I don’t think this book belongs in the same binding as the first three, even though the characters are the same and the narrative overlaps with where the third book left off. This foruth book – Tehanu – was written nearly two decades after the trilogy, and it is quite apparent as you read it after the first three books. What I loved most: I loved how ‘place’ was used in the book. It gave people characteristics, and culture. This is a novel routed in place, a very specific, detailed place with many landscapes. The first paragraph got me hooked. The island of Gont, a single mountain that lifts its peak a mile above the storm-racked Northeast Sea, is a land famous for wizards. From the towns in its high valleys and the ports on its dark narrow bays many a Gontishman has gone forth to serve the Lords of the Archipelago in their cities as wizard or mage, or, looking for adventure, to wander working magic from isle to isle of all Earthsea. There is a sense of vastness in the narrative. Sentences start in a very specific place and grow out into a vast landscape. Le Guin uses descriptions of the landscape to portray character: because what are we if not products of the places we grew up in? He was always off and away; roaming deep in the forest, swimming in the pools of the River Ar that like all Gontish rivers ran very quick and cold, or climbing by cliff and scarp to the heights above the forest, from which he could see the sea, that broad northern ocean where, past Perregal, no islands are. The Earthsea novels are enjoyable and intellectually stimulating. And if you are still unconvinced, I’ll give you another reason why you should read these books. Straight to Gont it flew, straight to the Overfell, straight to her. She saw the glitter of rust-black scales and the gleam of the long eye. She saw the red tongue that was a tongue of flame. The stink of burning filled the wind, as with a hissing roar the dragon, turning to land on the shelf of rock, breathed out a sigh of fire. Its feet clashed on the rock. The thorny tail, writhing, rattled, and the wings, scarlet where the sun shone through them, stormed and rustled as they folded down to the mailed flanks. The head turned slowly. ‘Sobroist,’ it said, in a whisper of steel sliding over steel.